The winners of the 2015 ShowBoats Design Awards, honouring the best in superyacht design, were announced this afternoon at the five-star Bio-Hotel Stanglwirt in Kitzbühel, Austria. Sixteen coveted golden Neptune awards were presented by double Olympic gold medallist, Shirley Robertson OBE, in front of a sell-out audience of superyacht owners, designers and icons of the superyacht industry from around the globe. The evening's winners included Grace E, receiving awards for her environmental efforts, which were commended by sponsor RINA, her Philippe Briand- designed naval architecture and visually striking exterior styling, as well as her "suave" interior design by Rémi Tessier. The Picchiotti-Perini Navi 73m superyacht was the big winner of the night, taking a total of four awards during the 2015 ShowBoats Design Awards. Neville Crichton’s Como also picked up three Neptune trophies for her Dubois-designed naval architecture and exterior styling, lauded by the judges for her shapes, colour scheme and design innovation, as well as her interior design by Redman Whiteley Dixon, which the judges felt matched the brief for a masculine yacht that supports entertaining on a grand scale. In the Exterior Design category for sailing yachts, the field was so diverse in classic versus contemporary design and also in size, an executive decision was made by the jury to divide the category into yachts over and under 40 metres. In the larger category, Andre Hoek took the plaudits for the Royal Huisman-built Wisp – described by the judges as “a real looker”, whilst Javier Jaudenes was also victorious for his exterior design for WinWin, which cleverly balanced the owners needs for racing and cruising. Pascoe International were commended for their work on their 9.6m custom tender, SL Limousine. The tender can be boarded at two entry points with full standing headroom at each, twin engines for 40-knot speed, and an impressive list of safety and security features. The Young Designer of the Year Award, sponsored by Oceanco, once again produced a record number of finalist entries from aspiring yacht designers all over the globe. With 34 individuals or teams submitting designs, the standard was extremely high. The winner, chosen by a panel of the industry’s leading yacht designers, was judged to be Timur Bozca for his project Cauta. In the judges' opinion, his design was unique in its Dynarig sail plan, which, in combination with what was considered to be a very proficient, forward-looking exterior design, created an accomplished yacht of striking appearance. The Lifetime Achievement Award, sponsored by Blohm+Voss and presented by the recipient’s close friend and colleague Lorenzo Argento, honoured iconic yacht designer Luca Brenta; renowned for his designs of innovative, contemporary and competitive yachts including the Wallygator, Wally B, Kenora, Ghost, Chrisco, the “B” Yacht series and the motor yacht Logica. Boat International Media takes this opportunity to acknowledge all of the sponsors and partners of the 2015 ShowBoats Design Awards who have helped to make the event a resounding success. Special thanks are extended to our gold sponsor, Swarovski, and to silver sponsor Blohm+Voss. 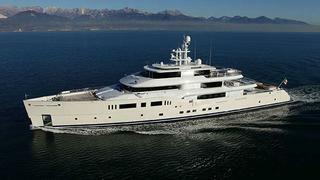 Thank you to Oceanco, who continue to support the Young Designer of the Year Award. Our gratitude also goes to our event associates: RINA, Front Street Shipyard, JFA Yachts, Videoworks, Clyde & Co, Esenyacht, Foglizzo, Boutsen Design and MTN and event partner, Foil.